Our comprehensive catalog of Federal Duck Stamps and Prints has been compiled to provide collectors the most complete information ever offered. A large variety of material is offered herein, such as mint and used stamps, unsigned stamps without gum, plate blocks, artist signed stamps, errors, prints and collateral material. Please note that we may not have all material in stock, particularly the rare items. However, we will be pleased to accept your want list for these items and advise you of price and availability when acquired. Explanations provided below are to assist you in understanding some of the philatelic terms used here. Note: RW1-20 were wet printed and due to the jumbo size of the stamp, natural gum bends or skips may be present on some stamps. They are not considered a fault, unless excessive. FREE Shipping on all orders in stock. Orders shipped within 3-5 days. Print form to prepare your order. All stamps are Fine to Very Fine Centered with NO major Faults - (No perfs cut design,tears or stains). Full color Album pages at $19.99 with FREE Shipping drop- shipped direct from the publisher. You can print the order sheet and circle your stamp(s) needed and mail to: 2221 Flora Ave, Fort Myers, FL 33907 or scan and attach to an email and send to davidhboshart@gmail.com and type STAMP ORDER in the subject line. 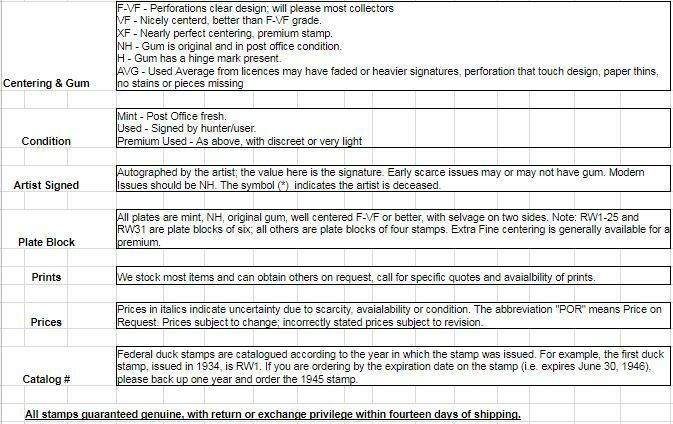 Or send an email but please keep in order from 1934 forward with the RW# include condition and price for each from the four columns - include Added Total - If order is over $150 Then Take a Ten Percent (10%) discount. Remember to include your preferred method of payment. If mailing this order please include a check.